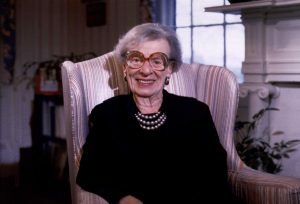 The child of Italian immigrants, Lola Aiken grew up in Montpelier, Vermont and was the valedictorian of her high school class. She spent the first years of her career working for a local law firm and in the office of Vermont’s Secretary of State. After volunteering for George D. Aiken’s campaign for United States Senate in 1940, she moved to Washington, D.C. to join his staff. She worked for Aiken for thirty-four years, eventually advancing to chief of staff. After she became his second wife in 1967, she continued as his unpaid chief of staff until his retirement in 1975. 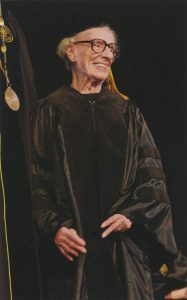 Mrs. Aiken dedicated her retirement to community service and philanthropy; among numerous other board positions, she served as a Trustee of Champlain College from 1977 to 1995. She received Champlain’s Distinguished Citizen Award in 1994 and was awarded an honorary doctor of laws by the College in 2007. Aiken Hall is named in her honor. This entry was posted in Special Collections on March 15, 2016 by Erica Donnis.